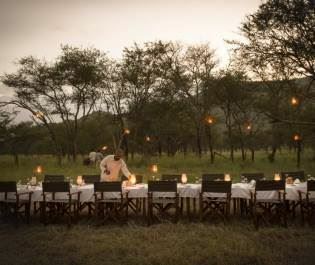 Singita Serengeti House is the perfect place for a care-free safari trip with family and friends. 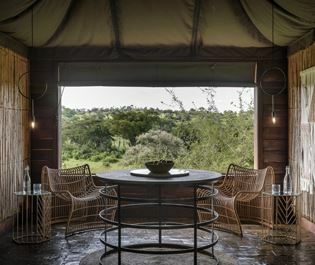 Nestled on a rolling hill in the open plains of Singita Grumeti in Serengeti National Park, this private-use lodge uses its unspoilt surroundings to create an intimate, luxurious space. 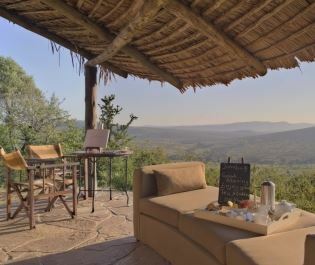 The first thing you’ll see is the opulent main house, and its expansive veranda overlooking the sweeping plains. Featuring an infinity pool, trendy sun loungers, a roaring fire pit and a chilled outdoor lounge area, the veranda is a great place to watch wildlife roam by, or even come up to the pool for a quick drink. 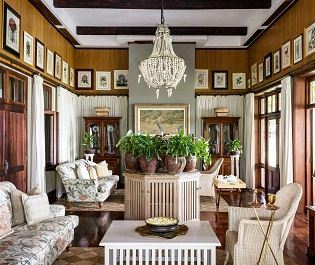 The four suites, two in the main house and two nestled in the gardens, are airy and fresh, adorned with local African art and featuring a gorgeous four-poster bed, an exposed brick fireplace, a TV, a lavish en-suite bathroom, and a charming outdoor seating area. 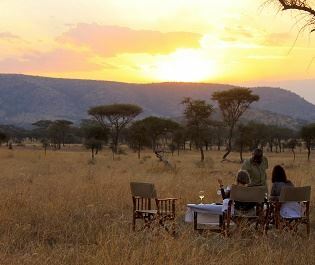 With your own guide, vehicle, chef, and house staff, you’ll be sure to feel like royalty in between fascinating game drives. There’s plenty to do here too – we love lazing by the main pool, whilst there’s also a fantastic tennis court, brilliant cooking lessons and even mountain biking on offer. 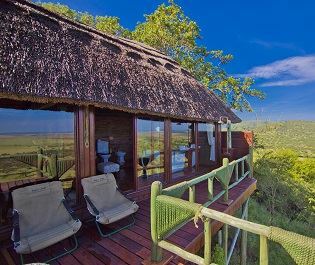 The earthy feel to this luxury lodge beautifully mirrors the wonderful savannahs that surround it, creating a memorable, calming place to relax and spot incredible wildlife. 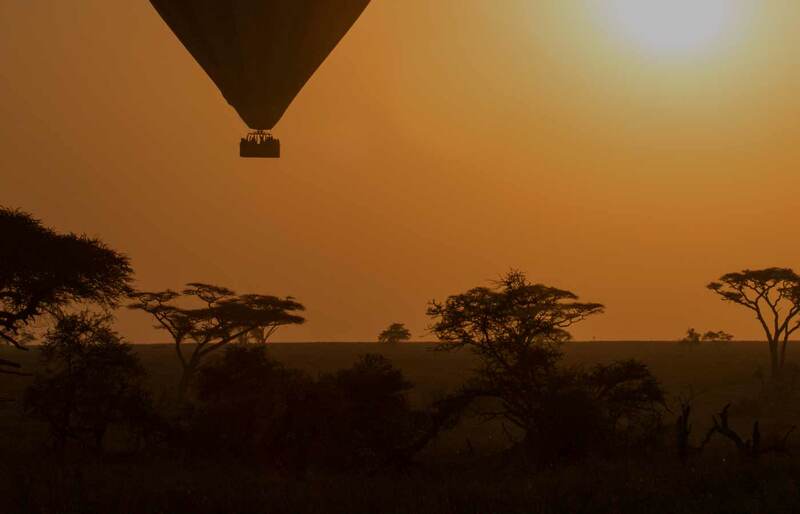 Serengeti Migration viewing is from June – July. 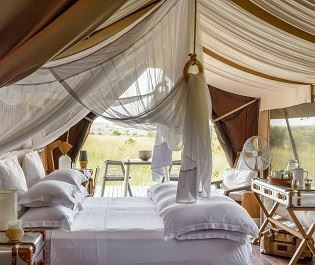 This is eco camping at its finest, and offers one of our favourite front row seats to the Serengeti wildebeest migration. 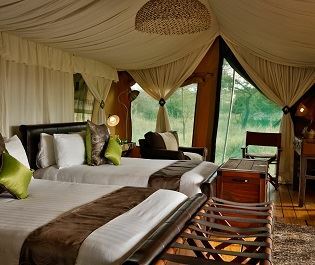 Once a cheetah conservancy, the incredible sightings of majestic wild cats at this tented camp never fails to amaze us. 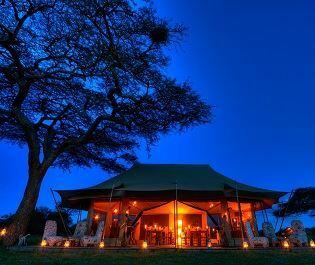 Showing that mobile camps can be luxurious too, this eco camp is perfect for those hoping for an authentic African experience. Close by to the Lamai Wedge migration route, this incredible view of the Serengeti migration never ceases to take our breath away. 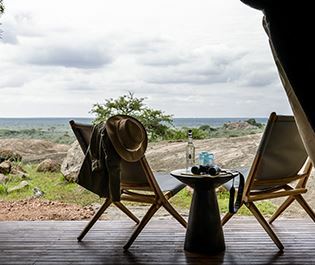 All year round this luxurious eco camp offers some of the best views of the wildebeest migration, making this one of our favourite mobile camps. We’re certain you’ll love the charm of this luxury camp - its décor created through local community projects make this camp feel extra special. 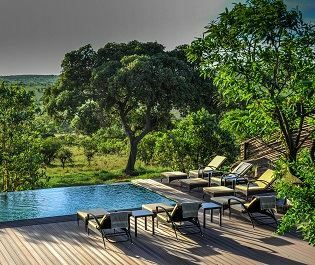 Views of grazing zebra from opulent private pools, delicious artisan pizzas and luxurious furnishings make this one of our more indulgent lodges. 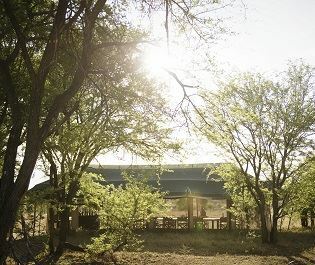 Nestled away from busy tourist areas and offering modern amenities, this eco camp offers a touch of luxury whilst watching the migration phenomenon. 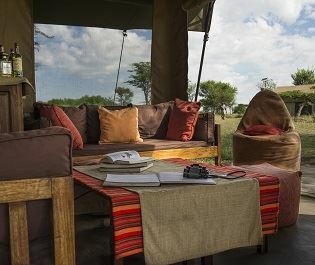 The views of the wildebeest migration from this charming mobile camp always take our breath away, as well as its beautiful, secluded location. 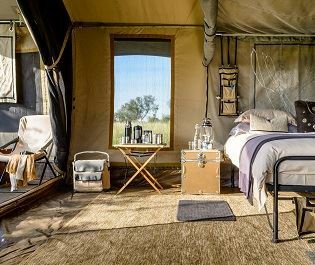 An off-the-grid experience is the best way to get that classic safari feeling, and this rustic camp offers a touch of romance, too. 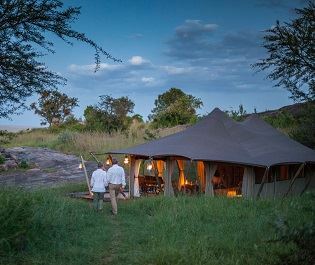 Living off the grid is one of our favourite pleasures of an African safari, and where better to do so than at this luxury private use camp. 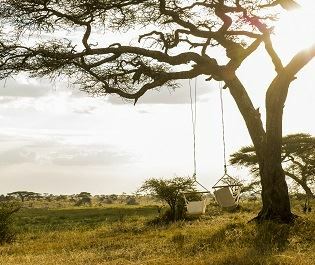 Connecting you with the wonderful flora and fauna of the Serengeti, Singita Faru Faru is a rural oasis we’re sure you’ll love. 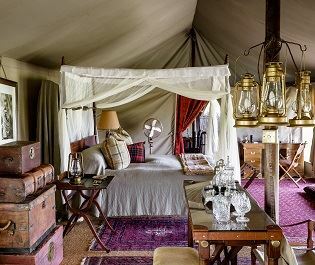 The lavish furnishings reminiscent of the 1920’s explorer era at this luxurious camp never fails to make us feel nostalgic. 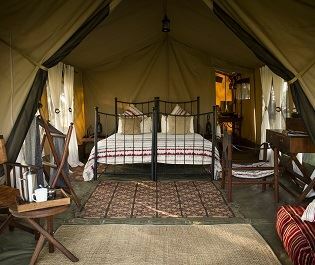 With contemporary tents and silver service dining, this is certainly one of our most luxurious mobile camps in Tanzania. 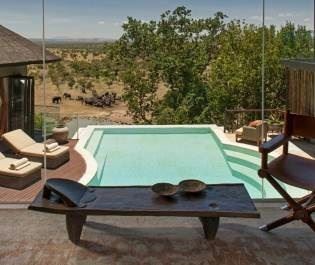 Exclusive and intimate lodge in the private Loliondo concession, providing an eclectic Serengeti safari experience. Offering year round migration viewing and wonderful vistas and decor to match, this luxury lodge has all you need for an indulgent stay. 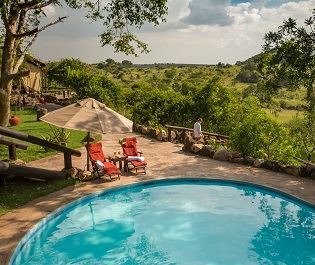 Enveloped by wilderness in the far north of the Serengeti, this intimate lodge delivers both the thrills and charms of big-game safari. 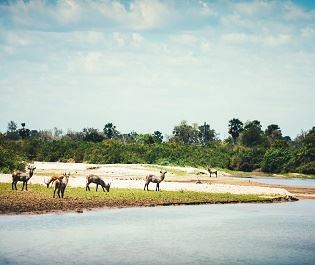 Perched on the Grumeti River banks, we always feel like royalty whilst indulging in luxurious amenities and enjoying a front row seat to the wildebeest migration. Grab a picnic basket and indulge in an afternoon spent watching leopard, lion and rhino roaming the plains at this luxurious eco camp. 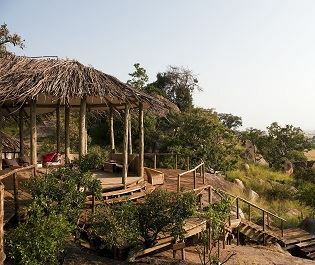 Running on solar power, designed by African craftsmen and nestled in the wilderness, there’s really no where better to spend time off the grid. 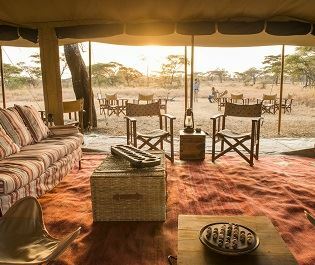 Perched on a major migration corridor, Dunia Camp really hones in on the ideal of comfort and luxury whilst spotting incredible wildlife. 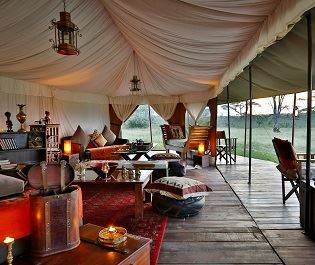 Perfectly blending wilderness with luxury, this small tented camp takes you to the heart of the Serengeti safari experience. 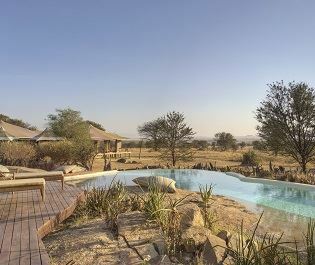 Contemporary luxury lodge in the Serengeti’s Western Corridor with thatched chalets and spectacular views over the grasslands. 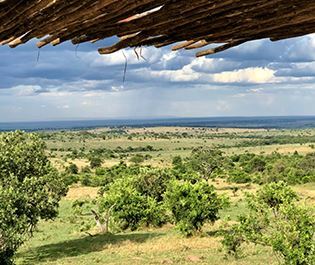 Opening in July 2019, this small and secluded retreat offers close proximity to the magnificent wildebeest migration crossing, whilst also offering an escape from the crowds. 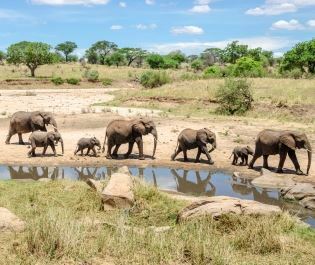 Tarangire National Park is one of our favourite hidden gems. 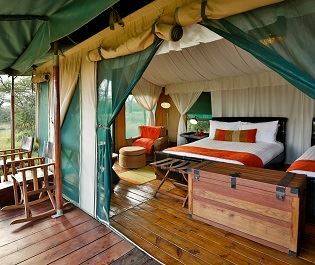 Abundant in elephants and luxury lodges, we think Tarangire should be on everyone's list. 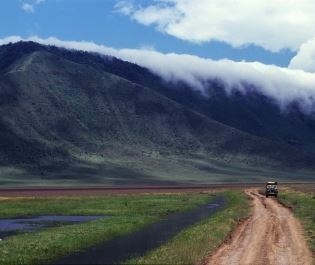 We think a trip to Tanzania just isn't complete without seeing Nogorongoro Crater's unbelievable beauty. Our luxury lodges get you close to the action, too. 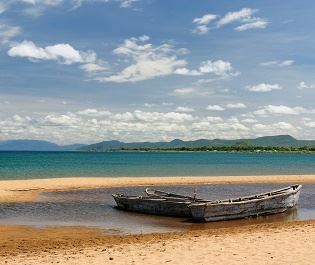 From the shimmering waters of Lake Tanganyika, to the verdant greenery of the Mahale Mountains, this area is a pure natural beauty. 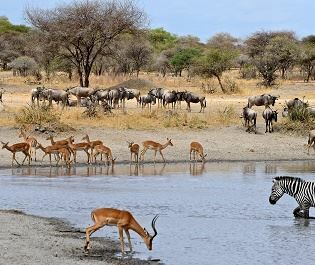 The exclusive Katavi National Park offers a remote hideaway full of magnificent animals, from robust buffalo and elephant herds, to elegant lion. One of Africa's simplest pleasures is a game drive with no other vehicle in sight. 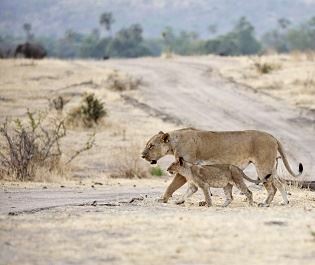 Explore Ruaha's savannah and we guarantee you'll be the only one for miles. Full of history and now home to East Africa's iconic animals, Selous Game Reserve is a fascinating area that always keeps us on our toes. Lake Manyara's picturesque settings always take our breath away, full of colourful birds, curious baboos and tree climbing lions.